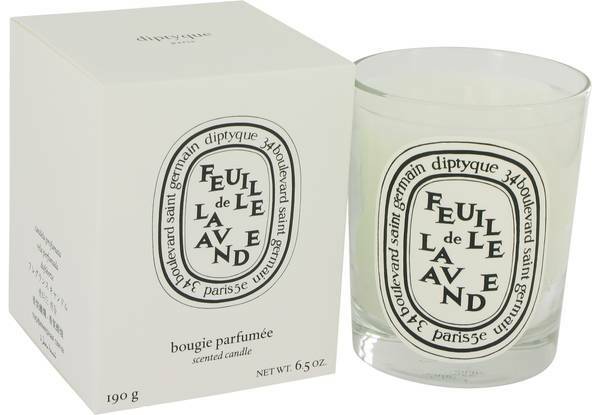 Diptyque Feuille De Lavande Perfume by Diptyque, Diptyque Feuille De Lavande is a rich, nuanced perfumed candle by the luxury fragrance company Diptyque. Light up this single-wick candle, and you might think you’ve been transported to the fields of Provence in June, the time when the lavender blooms are at their height. In English, the name of this candle is “lavender leaf” because the scent includes both lavender flowers and lavender leaves, creating a full-bodied and multidimensional aroma. Read More Read More Lavender flowers have an herbal quality to their floral fragrance, while lavender leaves are fresh and green with just a hint of herbaceousness. This white candle comes in a clear candleholder with the company’s signature oval label and has a burn time of 60 hours. Diptyque was founded in Paris in 1961 by three artist friends who came together to open a bazaar-like shop. Their fragrances became bestsellers quickly, and the company’s focus shifted to home fragrances, personal fragrances and home décor items. All products are original, authentic name brands. We do not sell knockoffs or imitations.